BACKTIME: How's Your Bracket Looking? Sure. Like you lost to Harvard. Right. New Mexico was my artsy pick for the Final Four, likely propelled by my love for Breaking Bad. 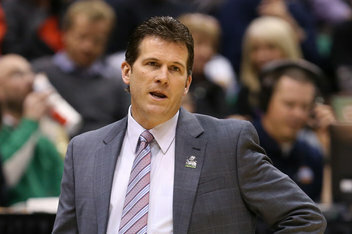 Unfortunately Steve Alford and the Lobos didn't get anywhere close to Atlanta. Neither did Georgetown or Gonzaga. This tournament has had it's share of upsets, but two regions still have #1 and #2, and one has #1 and #3. So for everyone whacking themselves on the head for not having Wichita, La Salle, or Florida Gulf Coast, there a lot of chalk still out there. Louisville will have a big home crowd edge and the seemingly easier road with Oregon, while Duke and Michigan State beat each other to death. This is the wild card. There's #9 Wichita and #13 La Salle facing off for the Final 8. And Ohio State-Arizona maybe the game of the round. Florida's road to the Final 8 was supposed to include UCLA and Georgetown, instead they get Minnesota and Florida-Gulf Coast. They look like a prime contender to knock off Kansas, if Michigan doesn't get there first. I'm very happy my alma mater has played well, and the Indiana/Syracuse clash also has a shot to be a great one. I still like Miami to emerge. So for all the attention to the Cinderellas, most of the big fish still lurk. So I suppose most brackets still look pretty good.